Start saving for what you really want--vacations, a new car, a new home--by staying on top of your everyday spending. With new tools to help organize your bank accounts and bills, Quicken Deluxe 2009 offers a smarter way to keep track of your money and set longer-term savings goals. See how Quicken Deluxe 2009 can help you save. Watch introductory videos and get step-by-step instructions on how to add your online banking and credit card accounts. Quicken shows you what's coming in, going out, and most importantly, what's left over each month to spend or save. See what bills have already been paid, what's coming up, and if you have enough left in your accounts to cover them -- all in one convenient place. Check in anytime to see exactly where your personal finances are at for the month. Call it "financial planning" or "budgeting," if you prefer, but it's really just being smart about where you stand. Quicken shows you what's coming in, going out, and most importantly, what's left over each month to spend or save. See what bills have already been paid, what's coming up and if you have enough left in your accounts to cover them -- all in one convenient place. Set reminders to pay bills on time and instantly check past bills if you need to verify an unusual charge or transaction. An intuitive "My Savings Plan" summarizes your actual spending and compares it to what you planned to spend for the month. Quickly see where you have room to spend or save more. Quicken's new, free service -- Quicken Picks -- helps you make the most of every dollar. Quicken Picks seeks out the best online coupons and discount offers just for you -- on items you buy and places you shop most often. And with Quicken Picks, you get cashback on all your purchases, helping you save even more. You can sign up for Quicken Picks anytime within your Quicken software. The Quicken.com Investing Portfolio gives you a 360¡ã view across all of your investments -- anytime from anywhere. Define goals, set targets, and perform thorough analysis of your 401(k), stock investments, and mutual funds with advanced tools and investing reports. Get alerts on your favorite stocks and funds to help you make informed decisions when investing. In the Setup tab, you can watch introductory videos and get step-by-step instructions on how to add your online banking and credit card accounts. Enjoy guidance and helpful tips on every page to help you stay on top of regular tasks like downloading transactions or scheduling bills. Instantly connect to the Quicken Community. Quicken's new, free service -- Quicken Picks -- helps you make the most of every dollar. Quicken Picks seeks out the best online coupons and discount offers just for you -- on the stuff you care about. And with Quicken Picks, you get cashback on all your purchases, helping you save even more. You can sign up for Quicken Picks anytime within your Quicken 2009 software. With a new look and feel and smarter navigation, the new Quicken.com Investing Portfolio gives you a 360¡ã view across all of your investments -- anytime, from anywhere. Define goals, set targets, and perform thorough analysis of your 401(k), stock investments, and mutual funds with advanced tools and investing reports. Get alerts on your favorite stocks and funds to help you make informed decisions about your portfolio. Enjoy guidance and helpful tips on every page to help you stay on top of regular tasks like downloading transactions or scheduling bills. Instantly connect to the Quicken Community. We are constantly adding new financial institutions to help you better connect to all of your accounts. 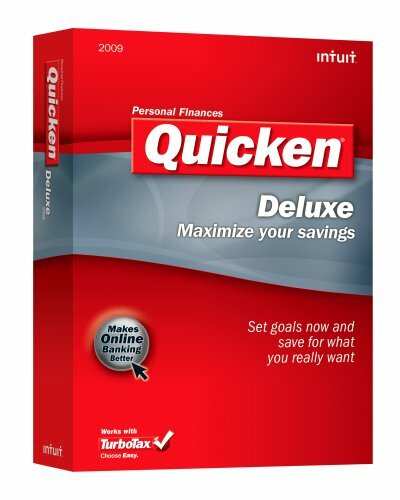 Quicken Deluxe 2009 personal finance software now offers access to over 6,000 banks, brokerages and other financial institutions -- including PayPal. Jump right in -- Quicken 20009 easily reads and imports your existing Quicken data. (1) Online features require Internet access and are subject to change. Services vary among participating financial institutions or other parties and may be subject to application approval, additional terms, conditions and fees. More than 6,122 participating financial institutions as of 05/21/08. (3) Email, Forums and Chat technical support provided 24 hours a day, 365 days a year. Phone technical support provided Monday - Friday, 5:00 am - 5:00 pm PDT. Additional fees may apply. (4) If you're not 100% satisfied, return Quicken software 2009 with your dated receipt within 60 days of purchase for a refund of the purchase price (return shipping and handling charges not included). Easy set up, easy to use. The product installed easily, and has been running nicely for 6 weeks. I've had no crashes or other difficulties. I have used Quicken since the DOS days back in 1988. I have a 20 MB Quicken data file covering my transactions from the beginning. Quicken 2006 had been doing everything I wanted, but the impending loss of on-line downloading had forced me to upgrade, albiet somewhat reluctantly after reading the reviews here. Back up your Quicken files before upgrading!!! I am fanatical about backing up my data, and so I have several copies of my Quicken file that are on an external drive, as well as one uploaded to my online data cache in case of a fire. Without these backups, installing Quicken 2009 would have ended in tragedy. Immediately after going through the update installation and first running the program, I knew there was a real issue. Almost all of my data was jumbled, with a total loss of historical data (including uploaded images of bank statements, canceled checks, etc). The program was sluggish, and when I ran the download function, nothing but my bank transactions and one of my credit cards downloaded. I double checked passwords and they were correct. The download failed again and every subsequent attempt I made failed as well. I decided to start with a clean slate and deleted all Quicken files and registry entries, rebooted, and ran the installer again. This time the program did convert my old data file correctly and my historical data was intact. I have used almost every version of quicken now for more than 15 years. I have never been so displeased as I am with version 2009. I am running on a Dell XPS 1330 laptop with more than 4 gig of memory and Quicken is unbearably slow when adding new transactions. I have been even more disappointed by the total absence of effective support. The support agents will tell you that your data file is corrupt, named improperly, not validated, or just too big. Nonsense! Quicken 2009 has simply veered off it's long standing path as one of the most well conceived and implimented applications every made. Now, bloated with gimmicks and advertisement monitoring, Intuit subjects us to arduous sessions of what should be, and have always been simple tasks. A great way to keep your finances organized. Quicken 2009 is the worst piece of bloatware I've ever used. I recently "upgraded" from Quicken 2006 and can't believe how unusable this software it is. The same data file now causes Quicken to use a 1 GB memory footprint. This is NOT the recommended amount of memory -- it's the actual amount that this application uses while running. Not even Firefox with 30 tabs and complex applications uses this much memory. The old version of Quicken used 35 MB of RAM for the same data. This version uses 30x that -- it uses so much RAM that you CAN'T USE IT! Intuit's tech support is beyond useless. They have no clue and keep telling me my computer doesn't have enough RAM. Yes, my version was very old, so when I could get Quicken Deluxe 2009 + Turbotax Deluxe 2008 from Amazon for only $5 more than Turbotax alone, I decided it was time to upgrade, even though my old Quicken still worked fine. The new one installed with no problems and upgraded my existing Quicken records (with over 10 years of history) quickly and flawlessly. I really haven't explored too many of the new features, so I'm not sure they are worth the upgrade alone. The user interface is somewhat busier now, but I do like the way it groups types of accounts together in the account bar on the left side of the screen (customizable of course) and shows your net worth based on your account balances, so in that respect it is more useful. Basically, if you are upgrading from an older unsupported version like I was, and you can do the upgrade for a reasonabl price (I'd say $20 or less) then it is probably worth it. Consider it money well spent to renew your support contract. With just a few weeks until my Quicken 2006 expired, I knew I had to make a decision soon. I've been using Quicken for ten years now and usually upgrade without hesitation but the large number of negative reviews gave me cause for concern. Most of the negative reviews centered on bugs and glitches, but these were from last year. So when I saw it on sale and noticed some recent favorable reviews, I went for it. Successfully upgraded without any issues. It imported and converted by back-up file without losing any of my data. After trying it out, I prefer the new "tabbed" interface and didn't notice any slowdown in performance. Another solid Quicken product. I have used Intuit's Quicken for many years and have considered Intuit to be one of the best software companies around. However, I was not completely satisfied with my Quicken Deluxe 2009 experience. First of all, since 2007, Quicken has not had a Basic Edition for around $30. I don't need a Deluxe Edition for around $50. That is why I didn't upgrade in 2008, but had no choice in 2009 if I was going to upgrade at all. When I installed Quicken 2009, the program would not run. The Quicken logo flashed on the screen and disappeared. I restarted and reinstalled Quicken. I had the same problem, so I checked what support options I had, as I had never had to contact Intuit support before. I was disappointed, to say the least, that Intuit does not offer free telephone support, but warns of a $25.00 fee. Moreover, Intuit calls you back; you cannot call in directly to get a support agent. So I had to settle for Chat support. I did get the problem resolved, but it took thirty minutes, whereas it would have taken about ten minutes if I had been able to talk to a live person on the phone. It turned out that I did not have the right mapi32.dll. The Chat support agent did pick up this problem pretty quickly, and once the new DLL was installed, Quicken worked. The mapi32.dll problem may not have been Quicken's fault, but I first spent five minutes trying to find troubleshooting help on the Intuit web site, and this solution never came up. I had previously thought that Intuit's help information was the best in the industry. My opinion of Intuit has moderated from 5 stars to 3 stars. Quicken is still probably the best such program around, but 2009 may not be as trouble free as it has been for me over the last ten-plus years. I was forced to "upgrade" because Quicken "In an ongoing effort to provide reliable high-quality products and services, Intuit periodically retires older versions of Quicken" Right. This is the most unstable,non-intuitive,slow, buggy,unusable piece of work I have seen. The bad part is I had no choice but to change. I will be looking for an alternative. Quicken 2009 (version R5) has a terrible problem with redrawing its panes after its has been minimized or covered by another window. Sometimes it only takes 1-2 seconds, but other times it goes on flashing for 5-15 seconds! Ouch, my eyes! Even worse, Quicken is causing my *entire* Windows desktop to redraw itself (they call ::InvalidateRect(hwnd=NULL) which is a big no-no). Quicken 2006 didn't have this problem, but Intuit forced me to upgrade as of 4/30/2009. Unfortunately, these basic basic problems overshadow potentially cool new features. For example, I notice the graphs look much better -- when they stop flashing. Very disappointing. 3 years of development, and this is the best you can do, Intuit? 3 years! Quicken's refusal to "support" earlier versions of its software made those versions obsolete and obligated us to upgrade to their Quicken 2009 software and it's atrocious. I began using Quicken in 1994 and have entered every single financial transaction of mine since then. I was recently forced by Quicken to give up Quicken 2006 Basic since they would no longer allow me to download stock quotes. Quicken 2006 Basic was a great program and I hated to see it go, but was hopeful 2009 Deluxe would be even better. Boy was I wrong. In short, the interface is so convoluted and complicated that navigating around is not as simple as it used to be. There's all sorts of buttons, drop-down menus, etc. that I'm having trouble grasping my big financial picture. Isn't that the point of Quicken in the first place? I'm not a new user to this version, either. I have used it for many months now and I'm still trying to find my way around the program. It's so irritating! It's painfully obvious that Quicken simply changed things around to call it "new" and make you buy the latest version of their software. But who can blame them -- car manufacturers do nearly the same thing. I have failed to see any new & helpful features in 2009 compared to 2006 besides a poorer user interface. After upgrading versions of Quicken for 15 years and being happy with each new version, going from 2006 to 2009 was truly the biggest Quicken letdown I've ever experienced. But like a brainless lemming, I will continue to use it hoping that Quicken will come out with something better in 2011 when they force me to upgrade again. I've been using Quicken for about ten years. I have never been "in love" with it. Almost none of the intrusive bells and whistles are useful to me. Much of the design and organization is, in my opinion, poorly conceived. Still, I've stuck with it. I managed to get it set up (with a fair degree of effort) to the point where it would automatically download most of my credit card transactions, and the reconciliation feature works. You have to upgrade every three years in order to continue to get the automatic download feature, so I paid my money and downloaded Quicken Deluxe 2009. It seemed to autoinstall over my Quicken 2006 just fine. But when I tried to use it, the trouble started. Initially, it would not open my data files at all, stating that I did not have "permission" to open the file. So I had to right click the specific file and use Vista's "open as administrator" feature. It then converted my file -- destroying, in the process, almost all of my historical data. Good luck doing your taxes! I do have hard copies of my bank statements, thank heaven, but my credit card statements only go back six months online. I also have backups of my Quicken files -- trouble is, I don't have a program that will run them anymore, since Quicken 2009 deleted Quicken 2006. And, oh boy, if you want a lesson in frustration, just try to get any customer support WHATSOEVER from Intuit. You get mazes of unhelpful computer page links if you try it online, and mazes of interconnected automated voice messages on the telephone. And the look of the new Quicken 2009 screen is horrible, even if it worked. Giant fat tabs, as if they had decided to dumb the old version down from 14-year-old to 8-year-old. Every time I have upgraded Quicken, the new version was worse than the one before -- almost all the "new features" are worthless while the useful features are buried and hard to find. I am utterly disgusted. I assume that, if I want to spend many hours of hard work, I could eventually get Quicken 2009 working on my computer, but I don't want to spend hour after frustrating hour of hard work just to get a personal accounting program working on my computer. This is the last straw. I'm going to try a trial version of some other software, starting with MS Money, and see if it can convert my old data files. If not, I'm giving up and going back to pen and paper! Don't Use it, even if it's free! I gave it one star it didn;t deserve. Quicken Deluxe 2009 After being a satisfied user of Quicken Deluxe 2000, I had to order the new version for my new Windows Vista 64 computer. Boy, what a disappointment! It suddenly throws up strange balances for no reason. After the third reinstall in a week, I decided enough was enough! Also, try to contact them. It's a joke! I should have believed all the poor reviews before I bought. I just couldn't believe it's as bad as it is. What has happened to Quicken? Hey, it's me again. I finally figured it out, no thanks to Quicken help. Upgraded from CD - No problem!! I have used Quicken for many, many years. I don't update every year, and was just forced to since I had Quicken 2006 and the downloading from banks/credit cards "end of lifed". I was nervous when I read all the negative reviews. I ended up buying the Quicken Deluxe CD from Costco. The installation was flawless. It realized I had a previous version, and it automatically uninstalled, and then installed. Then realized the previous file, converted it to the new version and started up. The speed is very similar to the previous version, and RAM usage about the same. All the passwords, account info, etc. seem to be in tact as well.